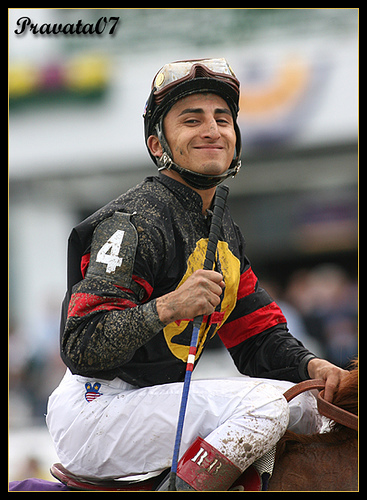 Jockey Rafael Bejarano punched the accelerator at the last minute to get #1 Mr. Holmes up. Really in the late stages of this race, it was Zephaniah’s to lose. But the 11-to-1 shot just couldn’t last. Zephaniah, who stalked the pace of #6 Dial Four Peace on the backstretch, began making his move on the turn when jockey Martin Garcia went to the whip. He took the lead in midstretch and it didn’t look like any of his rivals were making a move. Even race caller Trevor Denman thought 7-to-5 shot Mr. Holmes was all done. With an eighth of a mile to the wire, Denman gave him a monotoned midstretch courtesy call “Mr. Holmes plugging away from fourth,” while the horse was going nowhere, four lengths behind. But just about then, #1 Mr Holmes kicked in with a burst of speed and won in the last jump. I planned to bet Mr. Holmes at 2-to-1 or better, so his odds were too low for me. I ended up with $100 on both #3 Zephaniah and 7-to-1 shot #9 Mustang Aleyna.